The West Palm Beach VA Medical Center Healthcare for Homeless Veterans Program has been around since 2000. The program consists of the Homeless Veteran Outreach Team, the Veterans' Resource Center, the Grant and Per Diem Program, VA Homeless Contract Program, Incarcerated Veterans Re-Entry Program and HUD/VASH. Several programs are in development and this information will be updated as more services are offered. The Homeless Outreach Team includes a Social Worker and Physician Assistant who spend about 75% of their time working in the community. 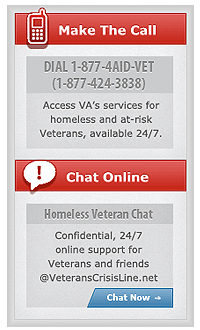 The mission is to contact homeless Veterans and provide treatment services. The goal is to return the Veteran to their highest level of functioning. This is done in a community setting. The team looks for homeless Veterans in soup kitchens, halfway houses, treatment facilities, street corners, woods, and wherever the homeless might be found. The Veterans' Resource Center is a separate building on the West Palm Beach VA Medical Center property. It is a drop-in center for homeless Veterans. There are a variety of services available: supportive social services, shower and laundry facilities, clothes closet, and food pantry. The Grant and Per Diem (G&PD) Program was created to pay community agencies to provide services to homeless Veterans. The services will include supportive housing and/or supportive services. The goal is to help homeless Veterans find housing, improve their level of functioning, and obtain greater independence. VA Homeless Contract Program programs provide housing, food, transportation, laundry facilities, and therapeutic services for homeless Veterans. The VA pays a per diem rate for each Veteran. Case management is provided to Veterans while they are saving their earnings for their eventual return to independent housing. In general, Veterans are expected to become gainfully employed within 1-3 months of entering the program. Veterans Re-Entry Program outreaches to eligible incarcerated Veterans who are within six months of release from state and federal correctional facilities to provide education about available VA and community services in support of smooth transitions from institution the community. HUD/VASH is an intensive case management program. The primary intent of the program is to reduce homelessness among Veteran populations by offering community-based services that emphasize the maintenance of stable housing. Veterans Justice Outreach (VJO) provides eligible, justice-involved Veterans with timely access to VA’s mental health and substance use services when clinically indicated, and other VA services and benefits as appropriate. Project CHALENG (Community Homelessness Assessment, Local Education and Networking Groups) is a program to improve VA and community communication. The idea behind Project CHALENG is to encourage cooperation and communication between the VA and community. Annual meetings are hosted by the West Palm Beach HCHV for VA staff and community agencies that provide homeless services. Fill out the CHALENG Survey to help us gain resources to combat homelessness. Stand Down events are one to three day events providing services to homeless Veterans. Services can include food, shelter, clothing, health screenings, VA and Social Security benefits counseling, and referrals to other services. These other services include housing, employment and substance abuse treatment. Stand Downs are planned by local VA Medical Centers, and include other government and community agencies that serve the homeless.